Beans, beans, they’re good for your heart… lol! My brother would finish that jingle. Anywhoo, do you like chickpeas? Garbanzo beans? Same thing, they’re a great source of fiber, iron, folate, phosphorous, protein and can even lower your cholesterol! As a Pescetarian I’m pretty fond of them. I’ve made patties for burgers, hummus and just cook them in veggie stir-fry dishes during the week. Like this one! This recipe is super quick and easy, I’ll make sure to record a video for it one day, but until then try it out! The key to this dish is the texture of the beans. I get my beans by bulk and soak them over night in a bowl of water or cheat by buying them canned. If you buy dry beans soaking is crucial to making sure that the beans are soft enough to enjoy this dish. 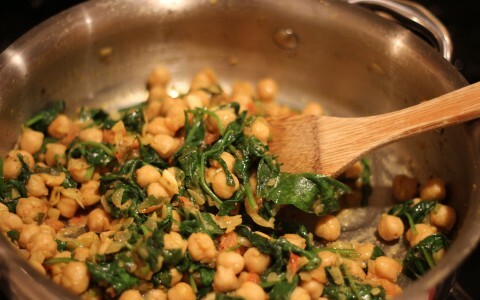 – Take 2 cups of chickpeas/garbanzo beans and place them in a bowl. Pour cold water over them – enough to cover the expected expansion which can be over double their original size. Drain and rinse the next day. -Cook those beans: 1 quart of water per cup of beans to a boil and then reduce to a simmer for 1-1.5 hours. You can add a bit of salt to taste if you’d like. Test the beans during cooking, as you don’t want them too tender for this dish, but not too firm either. Drain again and let sit to cool. In a saute pan heat olive oil and sliced garlic (not chopped) on medium. Just before the garlic is lightly browned remove the slices from the oil and set aside. Add onion (chopped) and spices. You can get creative here, add a pinch of cayenne pepper etc. or stick to the suggested (my favs). Stir and cook until the onion is soft and add the chickpeas! Stir until the chickpeas and onions are coated in that pretty yellow color from the Tumeric. Stir in the rinsed spinach and chopped tomato (or even drained pimientos!) and cover until the leaves are wilted and most of the liquid has cooked off. Season with salt and pepper and enjoy! PS: Today is Ash Wednesday, so if you’re fasting this would be a perfect dish provided that it falls in your fast guidelines!